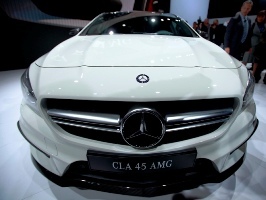 German luxury car maker Mercedes Benz on Thursday announced commencement of assembly of the S-Class sedan in India and has slashed the car's price by Rs 18 lakh (Rs 1.8 million) to enhance its position in the country. The locally produced top-end model S 500 will be priced at Rs 1.39 crore or Rs 13.9 million (ex-showroom, Delhi) and will be rolled out from the manufacturing facility in Chakan, Pune, Mercedes-Benz India said in a statement, adding that this strategic move will help to cater to the increasing demand. In January, the company had launched the S-Class luxury sedan in India, priced at Rs 1.57 crore or Rs 15.7 million (ex-showroom, Delhi) for the launch version of the new S-Class, which was fully imported. The company has already sold out the 125 units of the launch edition allocated by its German headquarters for India. The new S-Class currently has a waiting period of approximately 3 months, it added. Mercedes-Benz India Managing Director and chief executive officer Eberhard Kern said: "No other car stands for Mercedes-Benz brand promise more than the S-Class and we are delighted to manufacture the new S-Class at our state-of-the-art production facility in Chakan, Pune." He further said: "This also reiterates our commitment to bring world class manufacturing facilities in India to support our growth in the luxury automotive business." The company has advanced the plan to locally assemble the S-Class by a couple of months due to robust demand and has opened bookings for deliveries in June. Currently, Mercedes-Benz India locally produces S-Class, E-Class, C-Class, GL-Class and the M-Class, while it imports completely built units of the A-Class, CLS-Class, SLK-Class and the luxury tourer B-Class, among others.